Surrealist works feature the element of surprise, unexpected juxtapositions and the use of non sequiturs. Breton was explicit in his assertion that Surrealism was above all a revolutionary movement. Breton was an ardent communist, and numerous important Surrealist artists, including perhaps its most famous practitioner, Salvador Dali, would break from Breton over his political commitments. His writings include the Surrealist Manifesto of 1924, in which he defined surrealism as pure psychic automatism. Automatic writing or drawing (distinguished from drawn expression of mediums) was developed by the surrealists, as a means of expressing the subconscious. In automatic drawing, the hand is allowed to move 'randomly' across the paper. In applying chance and accident to mark-making, drawing is to a large extent freed of rational control. Hence the drawing produced may be attributed in part to the subconscious, or the Freudian unconscious and may reveal something of the psyche, which would otherwise be repressed. His novel, Nadja was a semi-autobiographical account of his encounter with a patient of Pierre Janet. Breton was married three times. His first wife, from 1921 to 1931, was the former Simone Kahn, after Simone Collinet (1897-1980). His second wife was the former Jacqueline Lamba, with whom he had his only child, a daughter named Aube. His third wife was the former Elisa Claro. Breton was an avid collector of art, ethnographic material, and unusual trinkets. He was particularly interested in materials from the northwest coast of North America. When faced with a financial crisis in 1931, most of his collection (along with his friend Paul Éluard's) was auctioned off. He subsequently rebuilt the collection, which was preserved by family members from the time of his death until 2003, at which time his books, art, and ethnographic materials were auctioned by Calmels Cohen. In The Magnetic Fields (Les Champs Magnétiques), a collaboration with Soupault, he put the principle of automatic writing into practice. He published the Surrealist Manifesto in 1924, and was editor of La Révolution surréaliste from 1924. A group coalesced around him—Philippe Soupault, Louis Aragon, Paul Éluard, René Crevel, Michel Leiris, Benjamin Péret, Antonin Artaud, and Robert Desnos. Anxious to combine the themes of personal transformation found in the works of Arthur Rimbaud with the politics of Karl Marx, Breton joined the French Communist Party in 1927, from which he was expelled in 1933. During this time, he survived mostly from the sale of paintings from his art gallery. Under Breton's direction, surrealism became a European movement that influenced all domains of art, and called into question the origin of human understanding and human perception. In 1935, there was a conflict between Breton and Ilya Ehrenburg during the first "International Congress of Writers for the Defense of Culture" which opened in Paris in June. Breton and his fellow surrealists were insulted by an Ehrenburg pamphlet which accused the surrealists of pederasty, among other things. Breton slapped Ehrenburg several times on the street, which led to the expulsion of the surrealists from the Congress. Crevel, who according to Salvador Dalí, was "the only serious communist among surrealists"  was isolated from Breton and other surrealists, who were unhappy with Crevel because of his homosexuality and upset with communists as a whole. "I don't know why I came here. Mexico is the most surrealist country in the world." While in Mexico, Breton had the opportunity to meet Leon Trotsky. Breton and other surrealists sought refuge via a long boat ride from Patzcuaro to the surreal town of Erongaricuaro. Diego Rivera and Frida Kahlo were among the visitors to the hidden community of intellectuals and artists. At a time when artistic freedom was under attack during the buildup to the Second World War—when Stalinist Russia was enduring the Great Purge—Breton and Trotsky wrote a manifesto Pour un art révolutionnaire indépendent (published under the names of Breton and Diego Rivera) which called for "complete freedom of art." Breton was again in the medical corps of the French Army at the start of World War II. 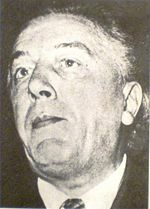 The Vichy government banned his writings as "the very negation of the national revolution" and Breton sought refuge through the American Varian Fry, escaping to the United States and the Caribbean in 1941. Breton made the acquaintance of Martinican writer Aimé Césaire, and later penned the introduction to the 1947 edition of Césaire's Cahier d'un retour au pays natal. During his exile in New York City, he met Elisa, the Chilean woman who would become his third wife. In 1944, he and Elisa traveled to Gaspésie in Québec, Canada, where he wrote Arcane 17, a book which expresses his fears of World War II, describes the marvels of the Rocher Percé and the northeastern end of North America, and celebrates his newly found love with Elisa. His works include the Surrealist Manifesto as well as the case studies Nadja (1928) and Mad Love (L'Amour Fou) (1937). Two Surrealist Manifestos (French: Le Manifeste du Surréalisme) were issued by the Surrealist movement, in 1924 and 1929, respectively. The first was written by Breton, the second was supervised by him. Breton drafted a third Surrealist Manifesto, which was never issued. Psychic automatism in its pure state, by which one proposes to express—verbally, by means of the written word, or in any other manner—the actual functioning of thought. Dictated by the thought, in the absence of any control exercised by reason, exempt from any aesthetic or moral concern. The text includes numerous examples of the applications of Surrealism to poetry and literature, but makes it clear that the tenets of Surrealism can be applied in any circumstance of life, and is not merely restricted to the artistic realm. The importance of the dream as "a reservoir of Surrealist inspiration" is also highlighted. The manifesto also refers to the numerous precursors of Surrealism that embodied the Surrealist spirit prior to his composing the manifesto, including such luminaries as the Marquis de Sade, Charles Baudelaire, Arthur Rimbaud, Comte de Lautréamont, Raymond Roussel, even Dante. Signers of the manifesto included Louis Aragon, Antonin Artaud, Jacques Baron, Joe Bousquet, Jacques-André Boiffard, Jean Carrive, Rene Crevel, Robert Desnos, Paul Éluard, and Max Ernst, in addition to Breton. Surrealism would have a profound influence on Modern art, and included many of the greatest artists of the twentieth century. It also introduced the notion of automatic drawing. Pablo Picasso was also thought to have expressed a type of automatic drawing in his later work, and particularly in his etchings and lithographic suites of the 1960s. ↑ Franklin Rosemont. André Breton and the First Principles of Surrealism. (London: Pluto Press, 1978, ISBN 090438339X). Breton, André. Richard Seaver and Helen R. Lane, trans. Manifestoes of Surrealism. Ann Arbor, University of Michigan Press, 1969. ISBN 0472061828. Rosemont, Franklin. André Breton and the First Principles of Surrealism. London: Pluto Press, 1978. ISBN 090438339X. This page was last modified on 20 March 2016, at 19:04.